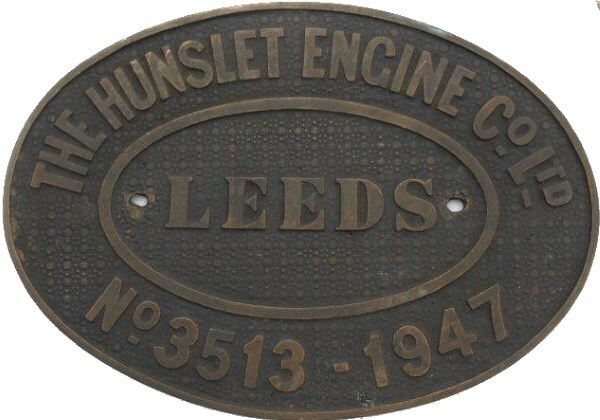 Lot 8 Brass Oval Diesel locomotive Worksplate "THE HUNSLET ENGINE CO LTD - LEEDS No 3513 - 1947". As carried by a 0-4-0DM Loco Named "NEWRY". New to Penmaenmawr Granite Quarries, North Wales. Sold to William Denny, Leven Ship Yard Dumbarton, then to Edward Collins, Kelvinside Paper Mill, Glasgow. Withdrawn out of use 1976. Ex Loco condition. Size 11".5 x 8".